This page was made possible in part by a grant from Pitt Year of Global. There’s a strange kind of FOMO, the dreaded fear of missing out, that happens when all your friends move back to school without you. House parties are thrown, box wine is popped, and Instagram is blasted with “OMG MY BESTIES ARE BACK! HAIL TO PITT!! !” Meanwhile, I still sat at home playing Uno with my family while the cat drooled in my lap. This wistfulness was uncalled for — after all, I was about to embark on an ambitious journey across the Atlantic, doing what every college student dreams. Fast forward a few weeks and now I’m studying abroad in Florence, Italy, for three months, living and learning in the heart of the historic center. I’m traveling with a program called Pitt in Florence, Pitt’s only semester-long program offered in that region. For the program, Pitt teams up with CAPA, a travel business that sends students from around the U.S. to Italy in the fall and spring. There are usually about seven Pitt students on the trip in the fall, which bumps up to around 20 in the spring. I decided to study abroad when the Italian culture charmed me during mandatory language classes in high school. A land with more than 1,000 years of history and each corner with its own distinct culture, I wanted more than anything to live and learn in Italy. After my first two years at Pitt, I decided to finally lighten my wallet and apply. My excitement for studying abroad was like a parabola. First, I was infinitely excited at being accepted, and then, as the weeks went by, it just became a part of my life that I had to explain over and over again for my family members. When the last few weeks before launch came around, the anticipation ramped up again, building until I felt like I couldn’t take it any longer.. I managed to keep it together, but my bag was fully packed a week before my plane was ready for takeoff. I was ready to go — no more checklists, no more “Top 10 Wineries around Florence” articles, no more teary goodbyes. Put me on the plane and take to the skies. I even took a picture of those skies once I finally got up there. That picture was the best part of my flight — or flights, rather. I coordinated with some other students from my program to travel out of the Philadelphia airport to Washington, D.C., then to Brussels and on to Florence. Three flights and I couldn’t fall asleep on any of them. I tried three different positions, listened to a podcast, listened to a relaxing soundtrack of a cat purring for 30 minutes and relaxed each of my muscle groups. Once I gave up, I thoroughly enjoyed watching “The Shape of Water” and “Baby Driver” for the rest of the trip. We landed at 11 a.m. and took a taxi to our hotel. Before the driver left, I managed to ask him for a lunch recommendation in stumbling Italian. He gave us directions to a market a couple of blocks away, and since we couldn’t check into our hotel until 2 p.m. we stuffed our bags in the hotel lobby closet and hit the streets. Reading the street signs was easy enough, but ordering lunch was a bit more difficult. The waitress was clearly not pleased with our request for tap water over sparkling, or our blank stares when she spoke too quickly for me to translate. But she warmed up to us eventually. The risotto alla pescatora — a rich, creamy rice dish with parmesan cheese and seafood — tasted delicious with each bite, and, exhausted, I ate every grain of rice. The plan after lunch was to check into the hotel, shower and get dressed before going to a store for temporary phone SIM cards. We all managed to shower and dress, but we were dragged into the dark pit of travel-induced exhaustion before we made it out the door. Two hours later, we finally got the SIM cards. Despite the long midday nap, we still passed out around 10 p.m., skipping dinner and nightlife. We had three months to explore — there was no reason to rush. The next day was check-in at the CAPA center. They provide the housing, teachers and classrooms for the experience abroad, as well as organize trips around Florence to help students integrate. After some paperwork, they sent us by cab to our assigned apartments. I wasn’t rooming with either of the girls I traveled with, but none of my roommates had arrived yet. Alone, I exited the taxi and met our landlady. She led me up four flights of stairs — no elevator — to the apartment. The place was all a student could need for a semester. It was a nicely decorated, clean two-bedroom apartment that was updated with modern appliances. Maybe Americans complain of the rooms in Italy feeling like shoe boxes in comparison to the luxurious spaces in the United States, but this was all the room I needed. After inspecting both rooms, I took the liberty of claiming the room that opened onto the building’s courtyard because I arrived first. I found it charming to be able to look out upon the tiled roofs and keep away from the commotion of the street. When I look down, I can see a neighbor’s small patio where their cute, fat cat likes to sunbathe. This is a perk I didn’t expect, but appreciate because it reminds me of my cat back home. All that said, the real reason I chose the room is because from the window I can see the very top of the Duomo, the most majestic, iconic cathedral from the Renaissance. 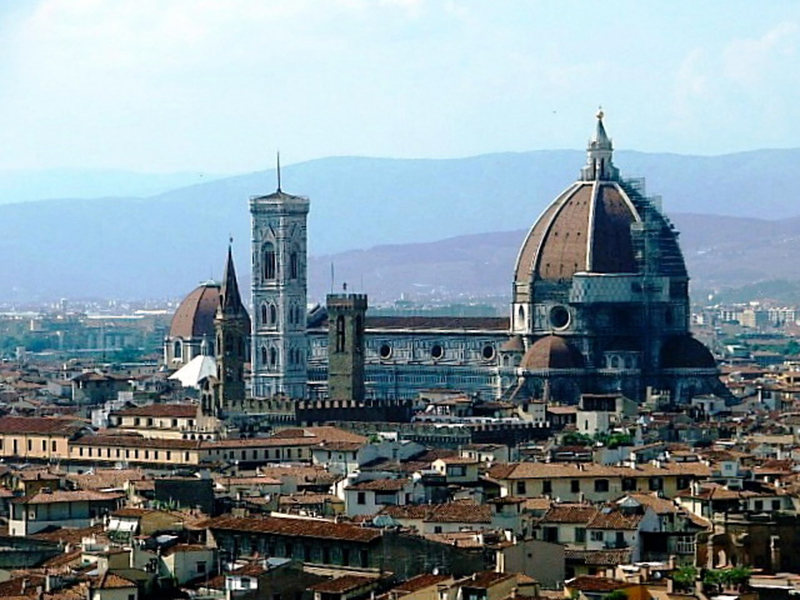 The view is my slice of historic Florence no matter how small. In a couple of days, classes will start and for the next three months, this will be my little corner of Italy as I study and volunteer and walk with the Florentines. I’m finally here! Like what you read? Check out our digital edition this Friday at pittnews.com to read the second installment of Grace’s blog. You can reach Grace at gem53@pitt.edu.